For eight years, Lovin’ Spoonfuls has been distributing fresh fruit and vegetables to social service agencies around Boston. Now, the nonprofit plans to expand into Springfield. “The region has the highest rate of child food insecurity in the state,” Lovin’ Spoonfuls Chief Operating Officer Lauren Palumbo said of Greater Springfield. Lovin’ Spoonfuls bills itself as a “food rescue” organization, which means it takes food that would otherwise be wasted and puts it to good use. 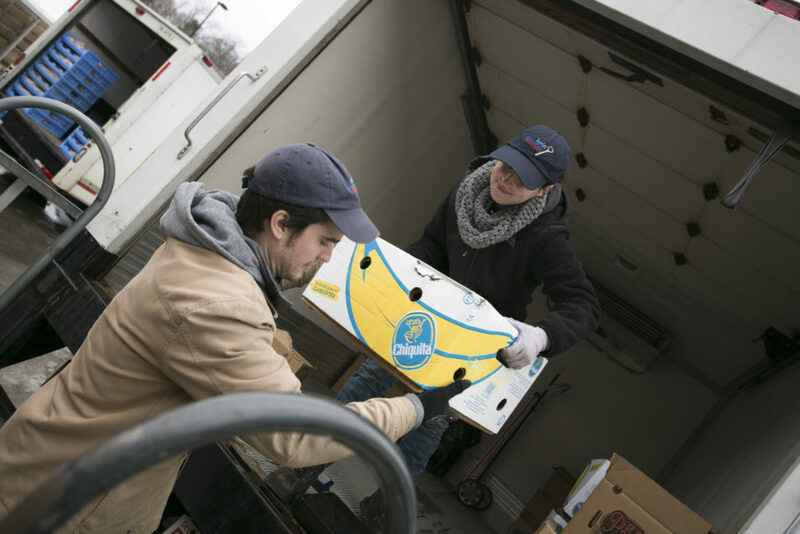 The organization’s six refrigerator trucks operate Monday through Friday, collecting 65,000 pounds of food a week from 70 businesses and delivering it to 150 beneficiary organizations. Most of the food comes from grocery stores, though some comes from farms and restaurants. It includes imperfect fruits and vegetables, dairy close to its sell-by date, and cartons of eggs where one is broken. Lovin’ Spoonfuls provides same day delivery to homeless shelters, soup kitchens, senior centers, food pantries, after-school programs and other nonprofits. Around two years ago, the nonprofit expanded from Boston to Metrowest, operating in Framingham and the area suburbs. In Springfield, Lovin’ Spoonfuls has been talking to the Big Y, the Food Bank of Western Massachusetts and other organizations to line up potential retailers and beneficiaries. With the large amount of agriculture in Western Massachusetts, Lovin’ Spoonfuls is also trying to tap into the farming community. “We want to make sure folks in need in the region have access to the same amazing fruits and vegetables that consumers at farmers markets and farmstands have,” Palumbo said. One truck can handle 500,000 pounds of food a year from 10 venders – or enough for 25 nonprofits serving around 6,000 people. Palumbo said Springfield would be the “hub” of the distribution route, but the organization could expand into the surrounding areas. “Over time, as we’re able to build relationships and build more commitments from the community in terms of fundraising and food sourcing, we grow to meet the need of the community,” Palumbo said. For now, the holdup is fundraising. It costs $100,000 a year to run each truck. The organization secured $50,000 in state money in the current state budget, the final installment of which was just released. The organization is working with lawmakers to secure another $100,000 in the fiscal 2019 state budget. The budget that passed the House included $50,000. Palumbo said the organization has applied for several grants and is talking to potential funders in Western Massachusetts.